Paper, touchscreen, and audio ballots are available in English and Spanish at all polling places on Election Day and the Government Center Voting Center, beginning 29 days before the election. Paper Ballot: Magnifying devices are available at each polling location for voters who may have difficulty reading the ballot. Touchscreen Ballot: For touchscreen voting, the ICX accessible voting machine is equipped with a touchscreen viewing device with large-print text and adjustable font controls. To use the touchscreen ballot, voters make selections by touching the screen, and may review their selections on a paper record before casting their vote. 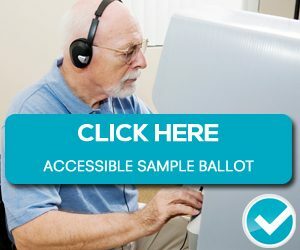 Audio Ballot: For audio voting, the ICX accessible voting machine is equipped with headphones and a Braille-embossed handheld keypad, with keys coded by color and shape. To use the audio ballot, voters are provided with audio instructions and guided through the ballot and may listen to their selections before casting their vote. To meet the needs of all Ventura County voters, the department offers a variety of tools, services, and assistive technologies on Election Day. On Election Day, “Accessible Entry” signs are posted outside polling places to direct voters towards the accessible entrance to the polling place. To confirm whether your polling place has an accessible entrance and voting area, check the back cover of your Voter Information Pamphlet for the international symbol of access, use the Polling Place and Sample Ballot Lookup Tool, or call (805) 654-2664. If your polling place is not accessible, you may choose to vote a nearby accessible polling place. Use the Polling Place and Sample Ballot Lookup Tool or contact the department to find the nearest accessible polling place that has the same ballot as your precinct. The department offers chairs and designated wheelchair accessible voting booths at all polling places and the Government Center Voting Center. The international symbol of access is posted on accessible voting booths so that they can be easily identified by voters. All polling places provide large-print instructions on how to mark a ballot, optical sheets to magnify the print on the paper ballot or other election materials, and pen attachments for easier grip when writing. The accessible ICX voting machine allows voters to connect a personal assistive device such as a head-pointer or multi-user sip/puff device when voting. The department can also dispatch a head-pointer or a multi-user sip/puff device to a polling place on Election Day upon request. If you would like to receive such a device to be available at your polling place, please contact the department using the contact form or call (805) 654-2664. The department trains poll workers to ask all voters if they would like to receive assistance related to voting. A voter may request assistance from a poll worker at any time. Poll workers may assist with reading the ballot to the voter and/or marking the voter’s choices using a paper or touch screen ballot. Alternatively, a voter may bring up to two people to the polls to assist them that are not the voter’s employer, an agent of the voter’s employer, or an officer or agent of the voter’s union. Any voter unable to reach their voting area may request to vote “curbside.” This option allows voters to park as close to the voting site as possible and vote, whether they are at the curb or in their car. Certain polling place locations that are not handicap accessible will have a sign posted outside with a phone number that will directly connect them to poll workers to aid them. When notified that someone has requested curbside voting, a poll worker will bring a Roster of Voters to the voter to sign, a ballot, a ballot secrecy sleeve, a pen, and assists the voter if necessary. For more information, please contact our office at (805) 654-2664. The department provides additional accessible voting options and services to ensure all voters can cast their vote privately. The voting center at the Government Center is open to all Ventura County voters starting 29 days before every election and offers the same accessible voting options that are available at the polling places, including wheelchair accessible voting booths, seated voting, and materials in large print. The Elections Division is located on the Lower Plaza of the Hall of Administration and is accessible through the main entrance of the building and using any of the elevators to the Lower Plaza. Approximately one month before the election, the department mails ballots to permanent vote-by-mail voters and those who have requested one-time vote-by-mail ballots. Along with their ballots, voters receive voting instructions with information about election deadlines, ballot return options, and a reminder that voters can track the status of their ballots using the Ballot Status Lookup Tool. Voters can return their voted ballot to the department using the return envelope enclosed in the Vote-by-Mail ballot packet along with two stamps attached. Ballots can be returned in person to the Government Center Voting Center beginning 29 days before the election, or to any polling place in California on Election Day. Voters may also return their ballots to the curbside drop-off stations outside the Government Center or authorize someone to return a ballot on their behalf. For more information about voting by mail, visit the Vote by Mail page. The Ventura County Clerk and Recorder’s office staff meets regularly with its Voting Accessibility Advisory Committee to discuss changes being made to improve access to voting and services for all voters in the county. Anyone who is interested in these meetings can call the Elections Division at (805) 654-2664. An interactive, accessible text-only version of the County Voter Information Guide is also available to voters through venturavote.org or by clicking on the photo.